We need your help to create the Even More section of the GWE. 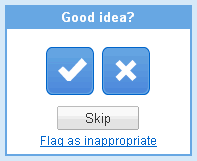 Using Google moderator please submit your ideas or vote on topics that interest you most. Molly, Ben and Sean will use these ideas to formulate the Even More section of the GWE. What in the World are People Saying About You? !